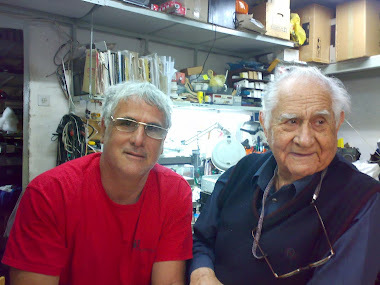 אתר הפטיפונים המגברים והרמקוליםon-stop shop and Eldad's laboratory are the business of sale and repair of audio equipment - stereos, turntables, tape decks, speakers, televisions and more. History tells the first days after the War of Independence and the founding of the state allowed small businesses and artisans tiny to fit between the houses on the street and was founded by Eldad "Radio Star". Already in his twenties business Eldad repairs and sales of radios, amplifiers, speakers and even electrical equipment home, such as irons, kettles etc to survive. After his military service in fixed, built and sold radios and amplifiers. big events and the mass of the days of elections and holidays active amplification systems, and the speaker broadcasting the squares and streets of Tel Aviv, speeches and music. in the sixties became Eldad dealer's first company "Snsoai", and was the first to bring down true stereo market. he coined the slogan: "What you hear is your own business, how and what you hear leave us." in 1966 purchased Eldad the television in his first operated by a tube. at that time could be expected at the stations of Jordan and Egypt alone, and began the sale and repair of televisions black and white. in the seventies began to flourish in stereo and have appeared in the men self-assembly. imported for sale from men, Rsivarim, speakers and turntables. in those joined by his son Ehud, he left the army, business, and he continues to successfully operate "Radio - The Star" with his father, Eldad. In recent years, the two opened a web site called: phono.co.il. Please visit the site! Hope to see you at the Radio - The Star "91-93 King George St. Tel Aviv Tel: 03-5282449 and we'll serve you faithfully!